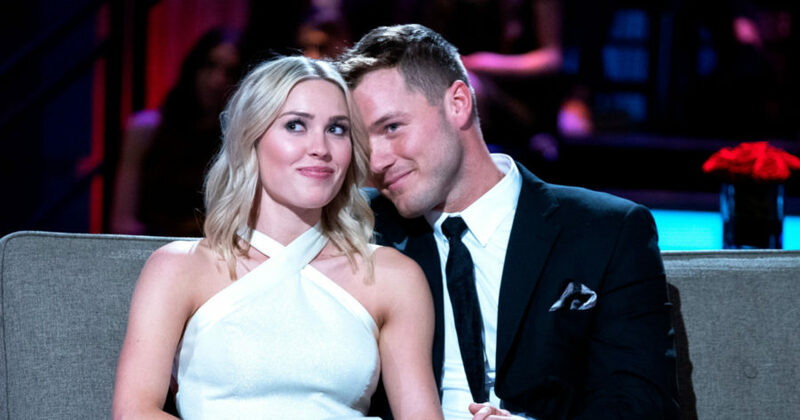 Love is in the air-- Colton and Cassie look loved up during their appearance on the Bachelor finale. The finale took place on March 12 and 13. In the craziest finale the Bachelor franchise has ever seen, Colton Underwood shed enough tears for the entire audience, but somehow I still found myself tearing up. The two-night finale spanned from March 12 to March 13 and concluded with a loved up appearance by none other than Cassie and Colton themselves. After showing clips of the finale all season long, we finally got to watch the fence jumping scene on night one. However, the scene was way too overhyped. It dragged on for so long, and I almost dozed off. In a way, it was sweet that Colton was willing to jump a fence for Cassie. Night one, we had to watch Colton’s painful breakups with both Tayshia and Hannah G. Tayshia ended up having to comfort Colton while he was breaking up with her because he was crying so much. Hannah G. had absolutely no idea it was coming and was actually planning on telling Colton that she loved him. An awkward turn of events left Hanna G sobbing, and Colton crying right alongside her. Tayshia and Hannah G. both had a chance to confront Colton on night one in the studio in front of a live audience. First was Tayshia, who confronted Colton about their firsts and their moments together on the show. Hannah G. came next, wondering what would have happened if things went different for the two of them. Let’s just say, they didn’t come to congratulate him. The preview for the second night foreshadowed a reunion between Colton and Cassie, in which I guessed that he would do anything to get her back. Boy, was I right. Cassie and Colton had a conversation in beautiful Portugal, in which Cassie expressed her fear of not being able to give Colton everything that he wanted in life, among those being a wife, a mother, and a best friend. Colton reassured her that they could take it slow and take it day by day, a statement that was answered by a kiss from Cassie. After their reunion, Colton had to explain to his family that they would only be meeting one girl instead of the planned two, merely because he had fallen in love with Cassie and felt it wasn’t fair to keep the other two girls around. The family clearly expressed their concerns that Cassie still wasn’t ready and didn’t know exactly what she wanted out of the relationship, but Colton just kept saying that he was in love with her and would do anything for their relationship. When Cassie finally met his family, she was met with a lot of skepticism. Both Colton’s mother and father expressed the same concern: they didn’t want Colton to end up heartbroken. Cassie kept reassuring them that she cared deeply for Colton and that she simply wanted to take things slowly, but was this reassurance for the parents or for herself? I found out the answer to that question quickly, as Cassie and Colton could not have looked more in love during their live studio appearance. I, for one, am very happy for the pair. Cassie was my front runner from day one, and I wish both Colton and Cassie happiness. In other Bachelor franchise news, the new bachelorette was announced towards the end of the program. Alabama’s own Hannah B. will be handing out roses as ABC’s next Bachelorette, but hopefully she won’t be as awkward as she was on the stage while meeting her first five men. Don’t miss the premiere of the Bachelorette season on May 13.